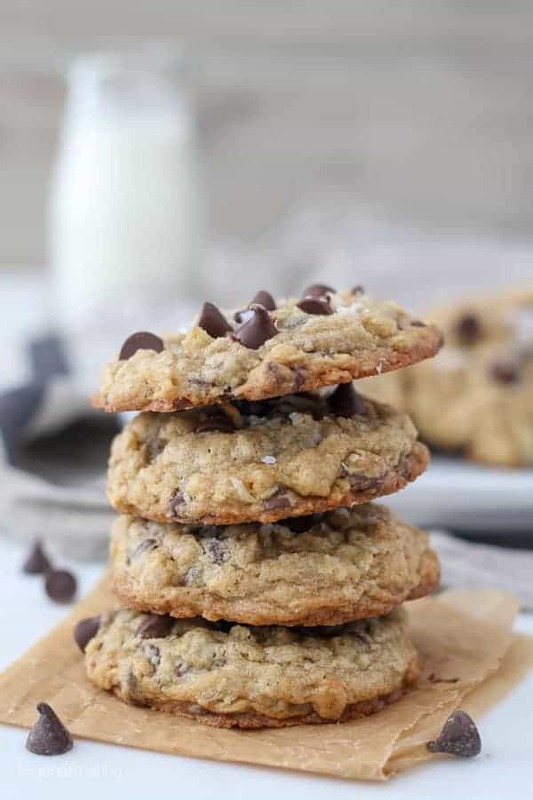 These are thick, soft and chewy oatmeal chocolate chip cookie loaded with oats and chocolate chips and finished with flakey seat salt. Homemade oatmeal cookies are buttery and just ever so slightly under baked in the middle with crispy edges. You might know by now that I am not-so-slightly obsessed with my oatmeal cookies, but almost every variation that I’ve made for my blog has salted caramel in it. While everyone raaaaves about them, I thought I owed you just a standard, chewy, oatmeal cookie recipe. Don’t get me wrong, there’s nothing basic about these, other than the ingredients list. 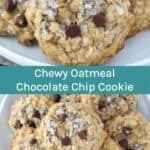 These are hands down among the best Chewy Oatmeal Chocolate Cookies I’ve ever had, and I am not the only one saying that. 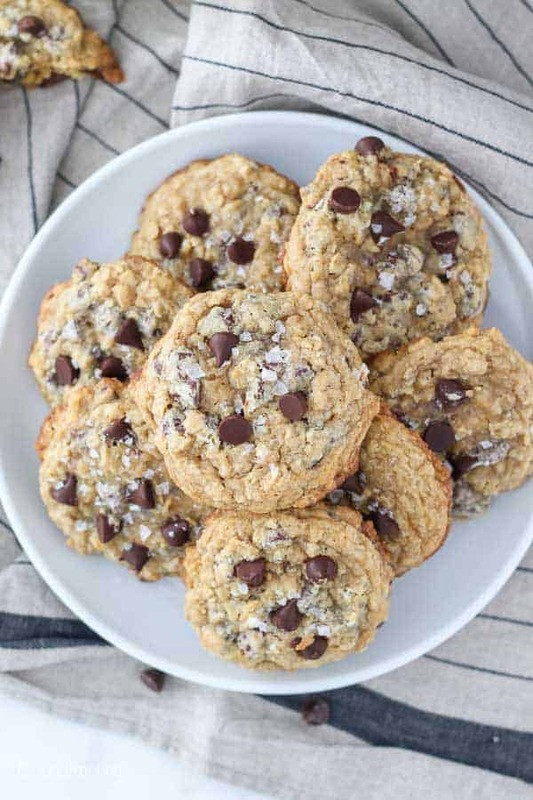 These are buttery, super soft and chewy in the center, slightly under baked, crispy on the outside edge and lots of texture from the oats and chocolate chips. Yes, my husband and I ate a whole batch without hesitation. No, I do not regret it. 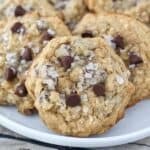 I made several versions of this oatmeal chocolate chip cookies before deciding on the final version. 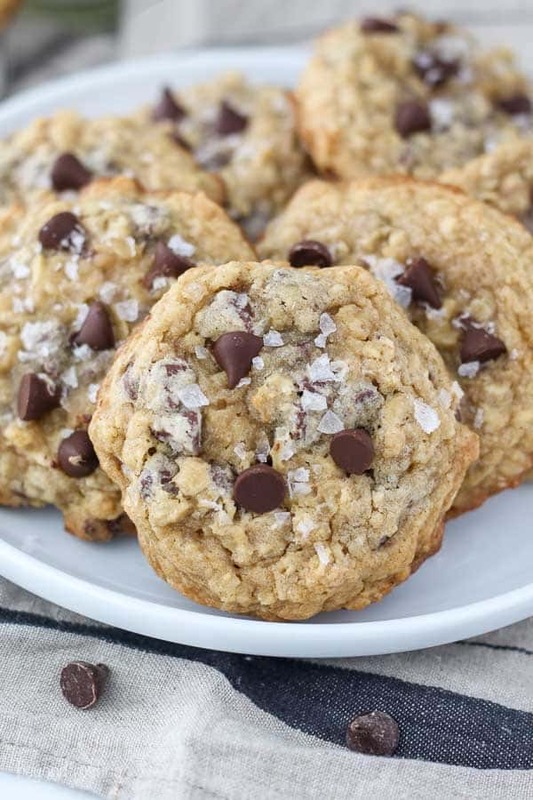 The difference between my salted caramel oatmeal chocolate chip cookie and this recipe is that I needed to reduce the dry ingredients that were helping to soak up some of that salted caramel. 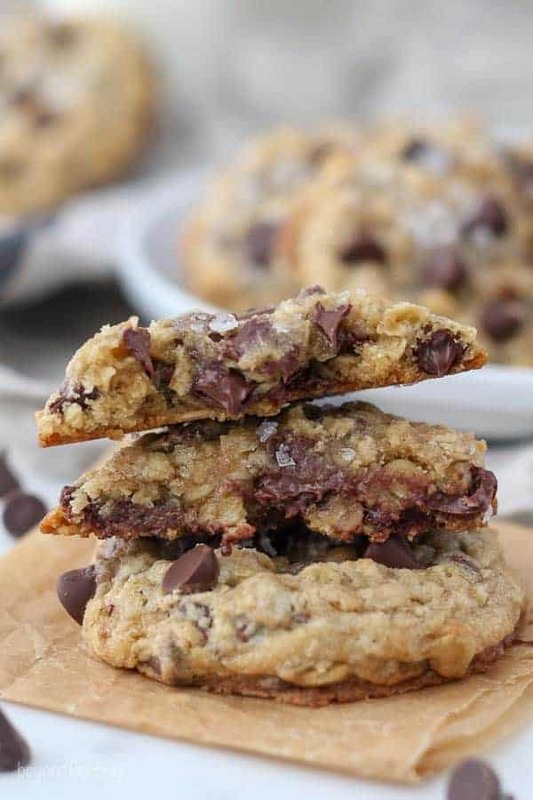 One of the best things is that this recipe does not have to be refrigerated which means you can enjoy a warm cookie with metly chocolate chips approximately 30 minutes from start to finish. If you’re anything like me, you can’t be bothered to let the cookie cool before you dig in. Another amazing thing about these cookies is that I start with cold butter, because I have zero patience as previously mentioned. This also actually helps give this cookie a little more volume then if you were to use softened butter. So, what I do is take the cold butter out of the refrigerator and microwave it for 10-12 seconds. That’s it. Look at how perfect that cookie above looks. Starting with softened or room temperature butter will result in a more flat, melty cookie, which is still good, but just not my preferred oatmeal chocolate chip cookie. See the difference in the cookie below? It’s more flat with a more crispy edge. Obviously you can see there’s a healthy sprinkle of sea salt on top. Do yourself a favor and invest in some high quality, flaky sea salt. My favorite brand is Maldon Sea Salt. 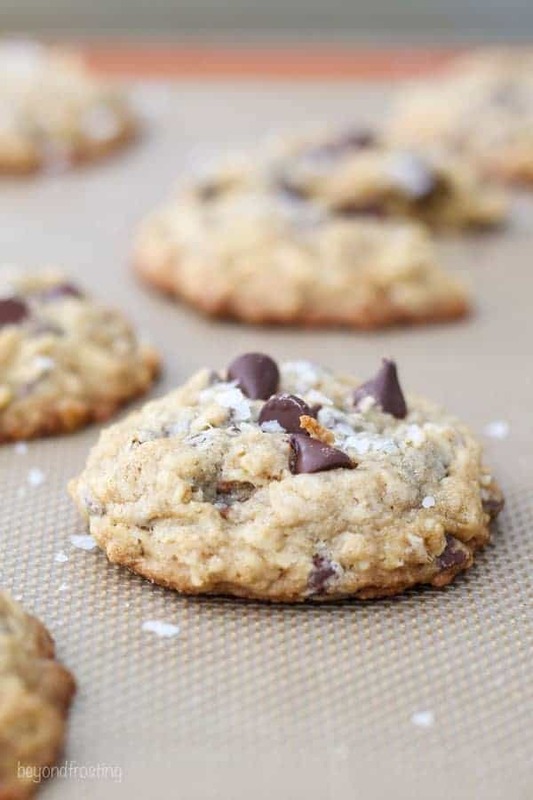 The sea salt on top is the BEST way to finish of these cookies, Salty and sweet is such an amazing combo. Other than that, this is straight forward recipe, so let’s break it down. Start with cold butter. Microwave is for 10-12 second. Next, cream together the butter, granulated and brown sugar until well combined. Then add the eggs and vanilla extract and mix until well combined. The mixture will be wet and grainy. In a separate bowl, mix together all the dry ingredients. The dough will thicken quickly as the dry ingredients are added. So, before the flour is fully mixed in, add the chocolate chips so they can be incorporated together with the dry ingredients. Line your baking sheets with silicone baking mats. These are game changers for cookie baking. It helps the cookies from spreading and burning on the bottom or edges. To ensure your cookies bake evenly, use a cookie scoopto keep the cookies are the same size. Bake for 11-13 minutes. You will pull them out of the oven before the centers are fully baked through. Leave them on your baking sheet for several minutes. I actually only bake one pan at a time and rotate them through. So while one sheet is baking, the other sheet has the baked cookies resting on them. HOT TIP! Right when you pull them out of the oven, take an angled spatula, a cookie spatula and any flat surface and push the edges of the cookies back towards the center of the cookie. This makes a nice round shape and also helps keep the center nice and puffy. What kind of Oatmeal is best for cookies? 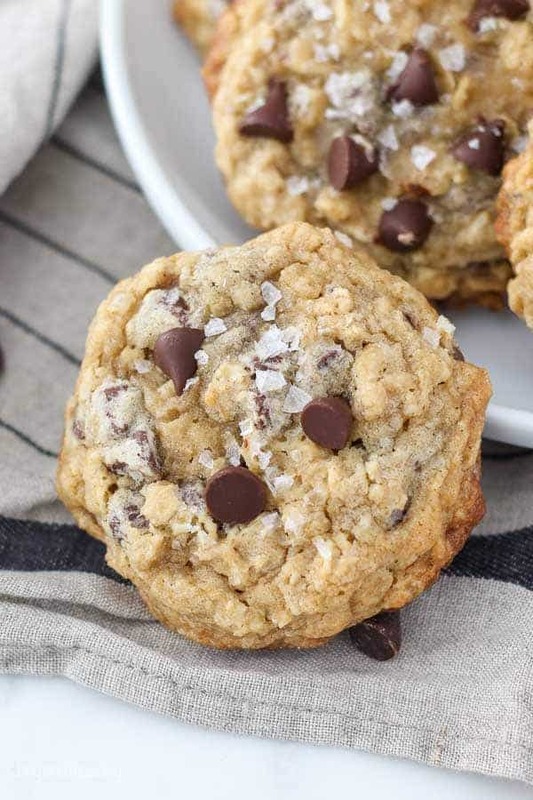 Rolled oats are best for cookies. They make for a really nice texture in the cookies and they also give them more chewiness. Can I use quick oats instead of rolled oats for cookies? Yes, you can use quick oats if that’s all you have. Quick oats tend to absorb more moisture and get a little mushier. So, for baking a cookie, they’re not the best option for the structure of the cookie, but the taste will be relatively the same. If you want to know more, check out The Kitchn’s article about the difference between the types of oats. What kind of chocolate chips should I use for these cookies? My personal favorites are semi sweet or dark chocolate chips, but really you can use any type of chocolate chips you want. Can I freeze these cookies? Yes! These freeze nicely. I usually place a piece of parchment paper in between the layers so the caramel doesn’t stick. If you’re like me, and can’t stay away, thaw one in the microwave for 10-15 seconds before eating. How do I keep these cookies fresh? Store them in an airtight container as soon as they are cooled. You can store them for 3-5 days but I usually like to freeze them if it’s going to be longer than 3 days. 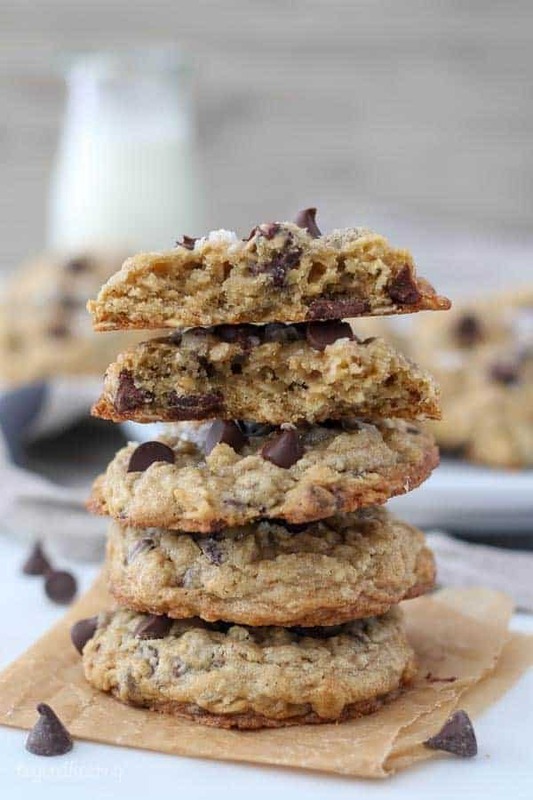 These are thick, soft and chewy oatmeal chocolate chip cookie loaded with oats and chocolate chips. Homemade oatmeal cookies are buttery and just ever so slightly under baked in the middle with crispy edges. Preheat the oven to 350° F. Soften the cold butter in the microwave for 10-15 seconds. Combine the softened butter with the brown and granulated sugar. Beat on medium speed until well combined, 2-3 minutes. Next add the eggs and vanilla extract and continue beating until well incorporated. In a separate bowl, combine the flour, oats, salt and baking soda. Stir to combine and slowly add the dry ingredients into the dough, mixing on low speed until dough starts to form. Before the dough thickens, add the chocolate chips. Beat a couple of times until they start to incorporate. 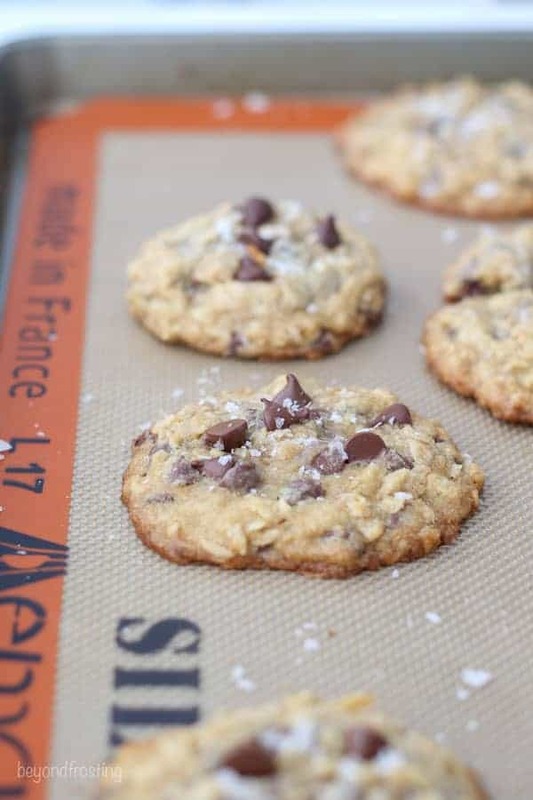 Line a baking sheet with parchment paper or a silicone baking sheet. Scoop the dough using a large cookie scoop and place on a sheet pan, 2 inches apart. Sprinkle with flakey sea salt. Bake for 11-13 minutes. The center of the cookie should be slightly under baked but not too gooey. Allow to cool on the baking sheet for 5-10 minutes before transferring to a wire rack to cool. When your cookies come out of the oven and they do spread or are misshaped, take a flat edge, such as a knife and press the edges of the cookie back towards the middle of the cookie, shaping it into a circle. So crazy because I was planning to make oatmeal choc chip for a friend who just ya a baby. This recipe looks perfect!! I may have missed it, but could you tell me how much a single/double batch makes? Thanks!! Hi Lisa- thanks for the callout! I added this to the notes in the recipe so it’s more clear. A single batch makes 10-12 large cookies and a double batch makes 20-24 with a large cookie scoop. Enjoy!